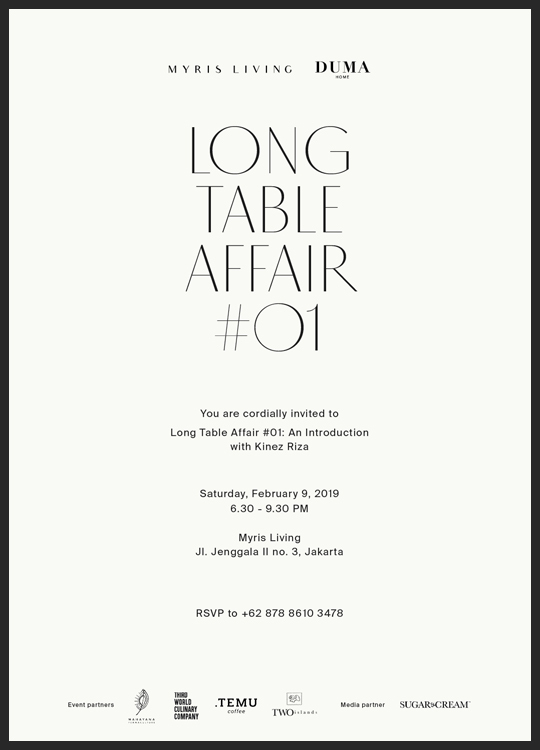 Kinez Riza will introduce the first of ‘Long Table Affair’ exclusively as part of the soft launch of Myris Living with the collection from DUMA Home. The dining event will be accompanied by a menu of curated local ingredients prepared by Third World Culinary Co. and Mahayana Permaculture. The guests will have a chance to uniquely experience on variation of ingredients, textures and aromas. Special selection of tea and coffee by .Temu with live saxophone entertainment. Then follow by a tour to see Duma Home collection. Wine will be served by Hatten Winery.